Respected Dr. A. T. Biviji was born on March 28, 1938 at Mumbai and completed his high school and Bachelor of Dental Surgery from Government Dental College and Hospital, Mumbai in 1964. He was awarded his postgraduate degree Master of Dental Surgery (Master of Dental Surgery) in Oral Pathology and Microbiology in 1967 from University of Mumbai. 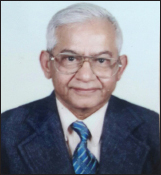 He started his career as an academician from Government Dental College and Hospital, Mumbai in 1964 where he rose to the rank of Professor, Head and Postgraduate guide in Oral Pathology in 1976. Dr. Biviji was transferred to Government Dental College and Hospital, Nagpur in 1982 where he took over the reins as dean till his voluntary retirement from government service in 1994. During this period, he has ably mentored more than 26 postgraduate students in the discipline of oral pathology with his affable nature and eye for detail. Postretirement, he rendered his expertise to S. P. Dental College, Wardha and V. S. P. M. Dental College, Nagpur as the dean and finally separated from active teaching in 2005 after having taught his dear subjects of dental anatomy and oral pathology for more than 40 years. During his academic career, he served as a professor for over 29 years and as a dean (along with professor) for 23 years. Dr. Biviji has published more than 65 research papers in recognized dental and medical journals and presented more than 45 research papers in scientific conferences. He has been a recipient of three Best Scientific Paper Awards. During his long years of teaching experience, he observed that students by and large tend to neglect the subject of dental anatomy and consider it as “dry”/”not interesting” and very often “not much useful.” To overcome this notion, Dr. Biviji put in his best efforts to simplify the subject by including the most important contents that are required for clinical application through his text book “Dental Anatomy” published by Bhalani Publishing house, Mumbai, 2nd Edition 1999. This simple straightforward book highlights morphology of teeth and chronology chart, methods of tooth carving, a chapter on occlusion made easy to understand, morphology of pulp cavities and tables of odontometric data. Dr. Biviji has served as the Chairman of Preclinical Board of Dentistry in the Medical faculty of Nagpur University. He was a member of Dental Council of India, New Delhi for 12 years and served as executive member for 3 years. He was an elected member of Maharashtra State Dental Council for 13 years from 1978 and was nominated as the President of Maharashtra State Dental Council, Mumbai in 1996. He is above all a teacher par excellence who was always available to his students who could approach him with least hesitation and was always sure to get solutions to their problems. His students are ever indebted to him for inculcating discipline, a sense of responsibility and reverence for the profession through his guidance and generosities. Dr. Biviji is incredibly blessed with an extremely loving, beautiful and graceful wife and two children, Mustafa who is a leading radiologist in Nagpur and Zohra, a renowned gynecologist in Pune. Dr. Biviji is blessed with three grandchildren and leads a peaceful retired life in Nagpur with his warm and close knit family.